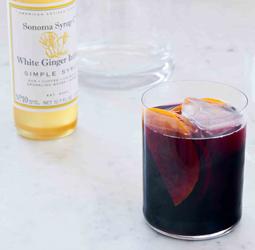 Spicy Ginger Sangria - A recipe from Savor California, the online showcase for extraordinary gourmet foods and beverages from California. Mix the wine with the Ginger Syrup. Add the fruit and orange slices. Put in fridge for up to a day. Fill tall glasses with ice and add the Spicy Sangria. Be sure to have a piece or two of fruit in each glass. Top with sparkling water. Enjoy!